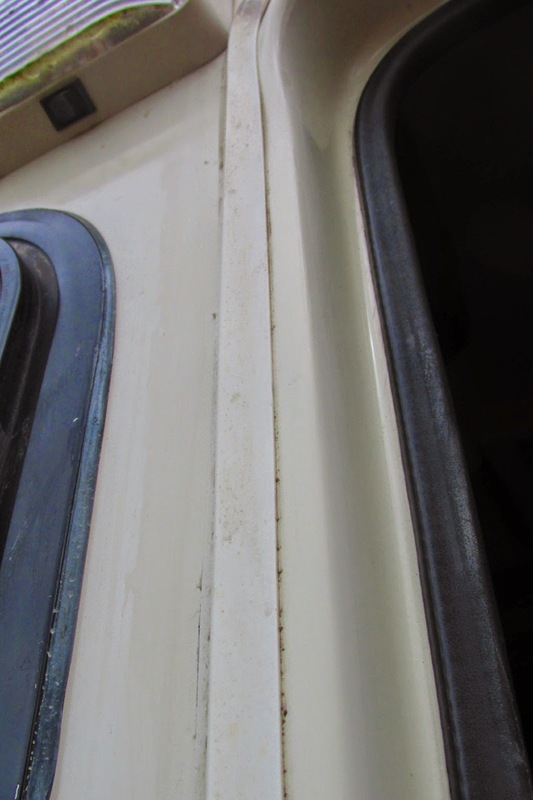 When I first bought my RV it had these horrible stains embedded in the rubber screw covers around both my entry doors. (main and driver's side) I tried EVERYTHING I could think of to remove the stains. It looked kind of like mildew, but mildew removal products didn't work. I tried bleach, common cleaners, you name it..I tried it. Nothing worked until I tried a product that makes outrageous claims. Usually these don't work. This one did! Mr. Clean Magic Eraser. A simple looking white sponge foam block, very deceiving. This little bit of foam is quite powerful. As a lark, I decided to try it on my dirty moldings. I mean, what did I have to lose? Nothing else worked at all and I couldn't source a same size/shape replacement. So, on a recent rainy trip to Tennessee, I gave it a shot. WOW! I won't lie to you, it took a fair amount of elbow grease to remove the stains. But they did get removed. 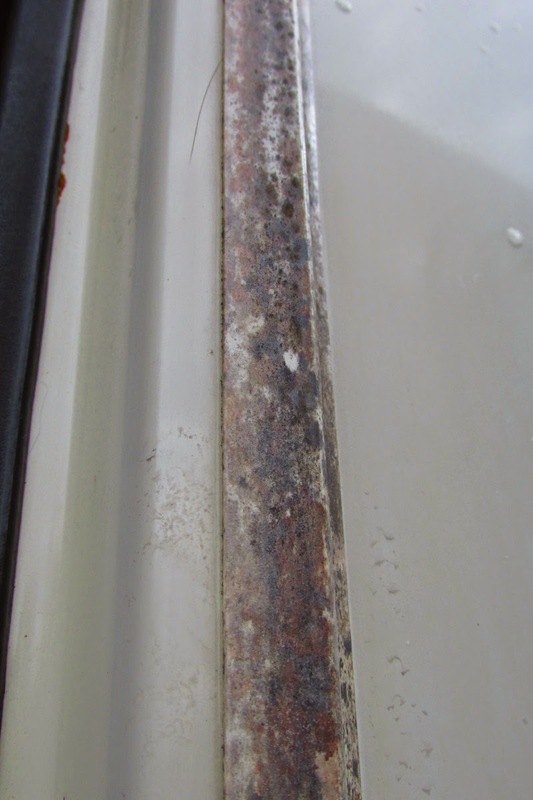 When I started, whatever the stain and discoloration actually is was embedded deep into the trim strip. I couldn't even SCRAPE it off. It had all sorts of colors in it, brown, green, red, yellow, purple. Looked very nasty. Like a terrible bruise that has begun to heal. OK, that's nastier, but this bruise on my RV had been there since the day I picked it up, years ago. I don't let many things bother me. 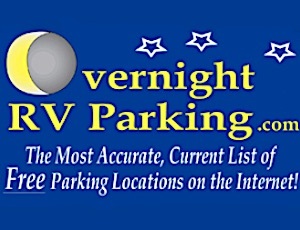 I mean RV'ing is all about relaxing and having a good time. But this just got my gears grinding. I had to see it every time I got in or out of the RV from ANY door. I wish I had tried this a few years ago and saved some of what little sanity I had. Lo and behold, after about 10 minutes of vigorous scrubbing with a Magic Eraser, the foam block had essentially disintegrated, but the molding was clean!!! I had a box of three of them in RV. In fact they had been sitting there for well over a year. I had purchased them at a liquidator store figuring I could find a use for them someplace at only $1, why not? Little did I realize they would solve a problem I had from the very beginning. Sometimes things just work out that way. Since I only had three of the Magic Erasers, I knew I wouldn't be able to finish the project until I bought more. Three of them got the entire door molding clean on all four sides. I had a tiny piece left and started on the driver's side door. I've only gotten about 1/8th of the way around it. I figure another three pack will do just dandy. Of course, all I see now in the stores are 2 packs and 4 packs. Yup, that's the way it works. No worries though, the 4 packs are only around $4. Every once in a while I am greatly surprised by a product. Mr. Clean doesn't go around saying his Magic Erasers will clean everything and anything. In fact...the packaging asks you to "discover the cleaning possibilities." I'll wager they never had RV trim covers and moldings in mind....but you never know! They are great at getting smudges off painted walls too. Read carefully what not to use them on! Important safety tip!! Read the packaging to make sure it's safe to use on your surface!!! !